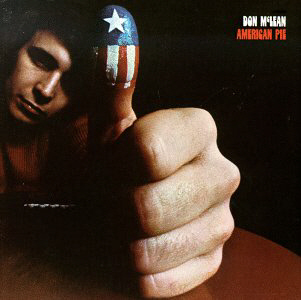 My friend Bob Suberi turned me on to this: A video examining the meaning behind Don McLean’s “American Pie.” In its several YouTube versions, this video has been viewed more than 300,000 times. Here’s the latest version, with an afterward by its creator, Jim O’Neill of Lone Star Sound & Pictures. Like many music lovers who grew up in the 70s, the lyrics of “American Pie” always fascinated me and made me wonder what really was the story behind the song. As a radio DJ in the late 70s and 80s I found the song quite helpful on any occasion where I needed to leave the control room for an extended period of time. The production of this video was quite by accident. A few years ago, to satisfy my musical curiosity, I’d done some research on the Web about the meaning of the song. My notes were saved in a document for future reference. I then completely forgot about them. In December of 2006 I had a hard drive crash and began the laborious task of retrieving data and ran across the “American Pie” document once again. At the time, I was teaching myself a new video editing program and needed a practice project, so this video became that project. I could never have expected the tremendous response I’ve received in just the first six months since I posted the first draft (two updates have since been posted). Less than a week after the first posting, the man who owns the land on which Buddy’s plane crashed in Clear Lake contacted me. I also heard from the MC of Buddy’s final concert. I took a journey to the legendary Surf Ballroom, the site of Buddy’s last performance. There I met Tommy Allsup, the “loser” of the coin flip with Ritchie Valens. At the Surf, I had a nice long chat with Bobby Vee, who may not have had a career had he not filled in on stage in Morehead, Minn., the night after the crash. I met the man who owns the flying service Buddy contracted with on Feb 2, 1959. He still has the wreckage of the plane. Forty-eight years later to the day, I got frostbite walking to view the memorial at the crash site. I’ve heard from relatives of the Miss America contestant who was dating Don McLean, and hundreds upon hundreds of fans across the world who have been touched by the song. Truly a testament to the power of the song … and the Web. This by no means is the definitive pictorial translation of the song, only Don McLean knows for sure … and he isn’t talking. However, after extensive research, I created what I believe to be a reflection of the most popular beliefs of what Don McLean was trying to convey in his song. I hope you enjoy it, and I look forward to hearing your comments! Nice to see this lives on as after over 3 MILLION views, it was pulled from YOU TUBE due to a copyright claim. Who knew one video project would introduce me to so many interesting folks? Glad that the music (and video) didn’t die! This is the most moving video I have seen. This is absolutely amazing!!! Thanks Jim for putting it together.